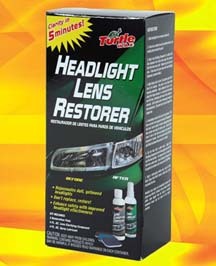 Turtle Wax HEADLIGHT LENS RESTORER. A product to restore the yellowed headlights. HEADLIGHT LENS RESTORER. Producto de Turtle Wax para limpiar las lámparas delanteras opacas.